Roberta E. "Bobby" Andrews age 83, of Monticello and formerly of Center Junction died Wednesday, April 30, 2014 at the Monticello Nursing and Rehabilitation Center. Funeral Services will be held 11:00 Saturday morning May 3, 2014 at the First Presbyterian Church, Monticello with interment in the Amber Cemetery. Friends may call from 9 until 11 Saturday at the church. Rev. Al Polito will officiate at the services. Goettsch Funeral home, Monticello is in charge of the arrangements. Surviving are four children, H. Phil (Joy) Andrews, Anamosa, Dale (Lois) Andrews and Evelyn (Thomas) Stoll, both of Cascade, Rex (Diane) Andrews, Center Junction; ten grandchildren, Scott (Tiffany Schmitt) Andrews, Kris (Dave) Martin, Travis (Katie) Andrews, Thomas (Jenna) Andrews, Timothy (Amber Fischer) Andrews, Sara (Michael) Rubocki, Douglas (Amanda) Stoll, Andrew (Haley Bell) Stoll, Dawn and Jason Andrews; seven great-grandchildren, Brynn and Reese Martin, Tate Andrews, Thomas and Shelby Rubocki, Benny and Ellorie Stoll; her sister, Vera Mae Moran, Center Junction, and a nephew, Michael Moran, Colorado. She was preceded in death by her parents, her husband Howard in 2010, and a brother-in-law Louis Moran and a niece Elizabeth Moran. Roberta Evelyn Johnson was born October 18, 1930 in Clay Township, Jones County, Iowa. She was the daughter of Norman and Dorothy (Saxon) Johnson. Roberta attended the Center Junction Schools. Roberta Johnson and Howard Andrews were married on November 23, 1948 at the First Presbyterian Church, Iowa City. The couple farmed in Jones County and in 1971 purchased Andy's Pub in Center Junction and operated it for five years. Roberta also worked at Super Valu in Monticello and Camp Courageous of Iowa for five years, and the Jones County Care Facility for twelve years. Following Howard's death she moved to Monticello. She had been a resident at the Monticello Nursing and Rehabilitation Center for the past twelve days. She was a member of the First Presbyterian Church in Center Junction where she was an elder and served on the session. 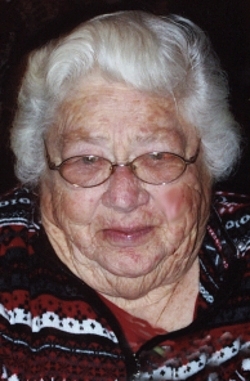 She also belonged to the Jones County Republican Party and was active on the Central Committee, the American Legion Auxiliary, and had served as the county Auxiliary President for several years.